Richard James has been busy. Hot on the heels of his ‘Mayfair’ ready-to-wear collection for John Lewis comes another collaboration with a UK high-street giant. This time, Marks & Spencer (now re-branded, somewhat bizarrely, ‘Your M&S’) have invited the Row’s modernist tailor to sprinkle a little Savile magic on their notoriously dowdy menswear department. The ‘Savile Row Inspired’ collection, to be launched on 29th March in the UK, France and Ireland, is all about “bringing the best of British style to the high street at M&S prices.” ‘The best’ in this instance is Richard James, who is probably most known for beginning the New Bespoke Movement on Savile Row, culminating with a feature in ‘that’ issue of Vanity Fair in 1997; the apogee of ‘Cool Britannia’, which is now a cultural irrelevance. 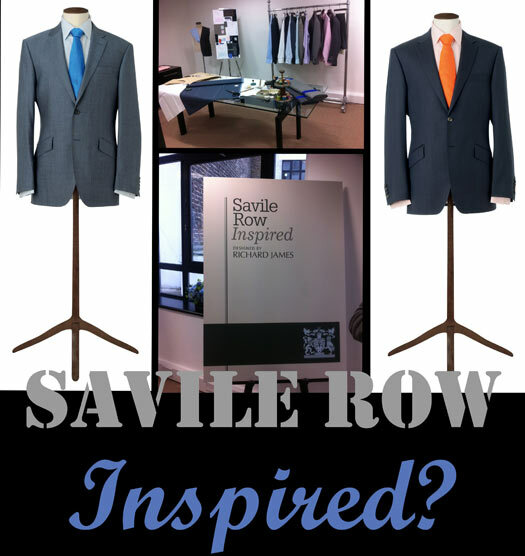 More relevant is James’ membership of the Savile Row Bespoke Association, a ‘club within a club’, that requires member tailors to put a minimum of 50 hours of hand labour into each two-piece bespoke suit. However, although it is fair to assume that James’ will not be requiring the same standards for his M&S branded wares, the ‘Savile Row Inspired’ collection is very much Richard James’ house aesthetic; two button jackets, slanted pockets, pin-dots and pick-and-pick. As such, the ‘Savile Row Inspired’ moniker is somewhat misleading. These are modern classics, not ‘old’ Savile Row; there are no window checks, flannel, loud stripes or unusual colours. This is very much ‘my first suit’ territory; cautious, unadventurous and ever so slightly predictable. If it were any other tailor, you’d question what input they’d actually had; with James, the restraint is standard. This is his signature, not that of the Row. Which, to be quite frank, is fair enough. After all, James has a reputation to maintain and M&S have customers to think about, as Richard Price, Director of menswear explains; “Fusing [James’] modern style, and unique attention to detail, with the M&S customer in mind, resulted in a brand new collection that exudes what the modern Savile Row look is all about.” Is it? Plain tangerine ties and bland two-button suits? If they were being simplistic in their honesty, M&S would say these are their own suits with a Savile Row name on the label. There are some attractive details. The slanted pockets are a nice touch and the buttons are decent. However, though as customer-driven organisations, a tailor and a high-street chain have some similarities, the truth is that M&S needed a bland touch for their collection in order for it to be commercially viable; the sort of thing for which many other tailors do not have the ‘credibility.’ It is somewhat curious that James, founding member of the Bespoke Association and an apparent protector of the great Savile Row name, has commercialised that name in so blatant a manner. Accessorising the collection are shirts and ties – the former don’t get much more adventurous than a Bengal stripe, the latter are pretty plain and uninspiring; they will both be a big hit with M&S shoppers. M&S have set themselves a worthy but lofty goal: “to improve the style credentials of M&S clothing and to give its brands more distinctive values which resonate at an international level.” This collection, it claims, “…takes the exceptional quality and style of uniquely British tailoring to a global customer.” Unfortunately, the real ‘quality’ of tailoring is impossible to replicate in ready-to-wear; the style is the only export possible. Richard James, on the Row for just twenty years, claims he has defined it. I’m normally in agreement with your criticism (and praise) of high street brands, however, in this case I think some of your scorn is a little misplaced. I buy quite a lot of my clothing from M&S. I’m in my mid-20’s and while I am well aware of some of the more ‘dowdy’ items on offer there’s plenty of good stuff too. Indeed, M&S is one of the few places, for the RTW-seekers amongst us, where you can avoid the skinny lapel, the overly slim fitting suit and the arse-exposingly short jacket, the hallmarks of fashion forward brands which, ultimately, do not stand the test of time as much as the well-trod middle-road. Perhaps M&S’ range is a more moderate, conservative selection but this isn’t solely the arena of the sartorially ignorant. There is an elegance to simplicity and understatement. I admire and applaud your ability to be a bit more daring with your clothing but it isn’t a style I wish to replicate. Slanted pockets,no waistcoats, bland colours. I agree with the comments made by Paul. It’s difficult to find clothing on the high street that exudes classic style rather than up to the minute trends. However, a couple of days ago I found a couple of sports jackets in M&S that will make great investment pieces. Fashion changes, style remains.